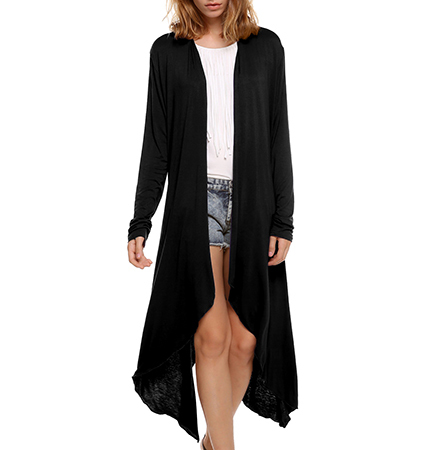 This long duster for women is a perfect garment for tying two looks together to make a cohesive, unified look for any outfit. It is a loose-fitting, flowing garment that pairs beautifully with shorts, jeans, slacks and skirts. It features graceful long sleeves that provide a snug, slender fit. The hemline is asymmetrically fashioned to fall almost to the backs of the ankles. At its shortest point in front, the hemline ends at the mid-thigh area of the leg. It comes in three color choices. Select your favorite from black, gray or pink. It is available for purchase in sizes Medium, Large and Extra Large.